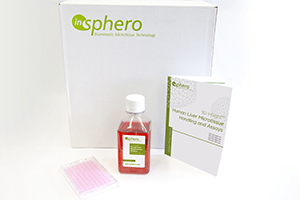 Assess multi-parametric steatotic endpoints 3D InSight™ Human Liver Microtissues are appropriate for assessment of steatosis-related cell parameters such as intracellular lipid content, reactive oxygen species production, mitochondrial impairment, cell death as well as changes at mRNA and protein levels. 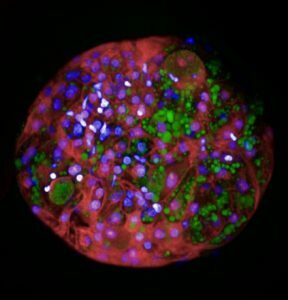 Oleic acid induces pronounced vesicular steatosis in hepatocytes after 7 days of treatment. 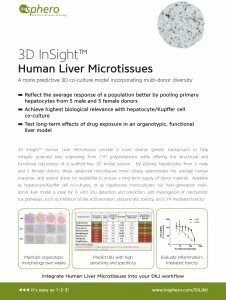 Primary human hepatocytes were used to assess the susceptibility of the 3D InSight™ Human Liver Microtissues to free fatty acid-induced steatosis. 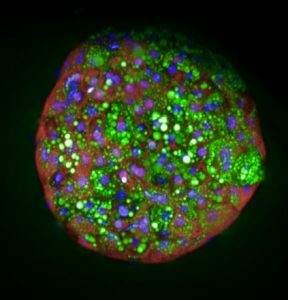 Phenotypic high-content assay was performed to study steatosis in 3D liver microtissues. Nile Red stained lipids are shown in green, nuclei are shown in blue, membranes are shown in red. 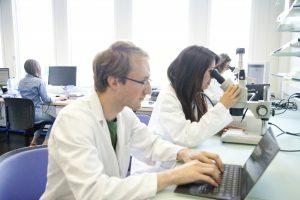 Stack imaging was performed on the Opera Phenix™ High-Content Screening system. 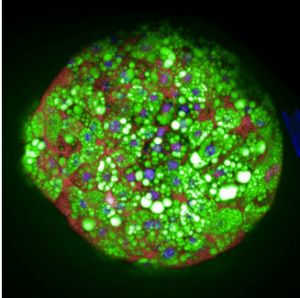 a long-lived 3D liver metabolic disease model.